The B.E.A.T. Blog | B.E.A.T. (Bridging Education and Arts Together) is a non-profit organization that provides exciting programs for urban youth. B.E.A.T. (Bridging Education and Arts Together) is a non-profit organization that provides exciting programs for urban youth. Beat Rockers was blessed to have special guest Mark Martin, aka: Mandibul, perform and guest teach on Nov 15. Mark is on the international cast of Voca People, a world renowned vocal percussion Broadway show currently being shown in NYC and Paris. Mark kills it by rapping in his own language while beatboxing at the same time. 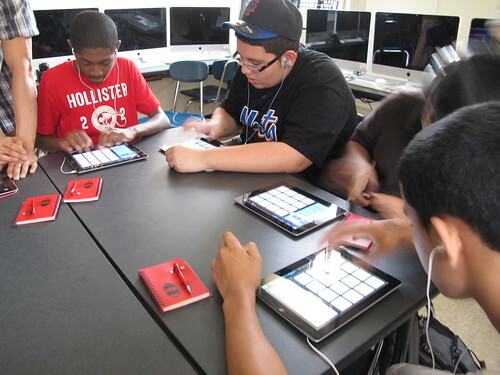 BEAT MAKERS music production program on iPad taught by DJ Dhundee! 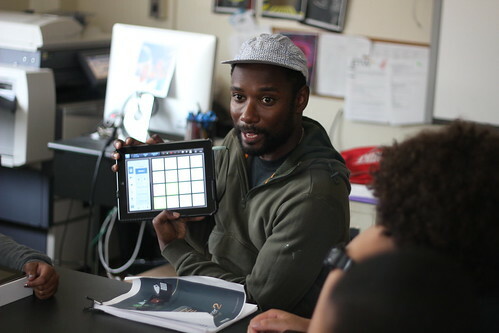 Professor DJ Dhundee is leading this pioneering music production class taught completely on the iPad2 using an app called Beat Maker 2. 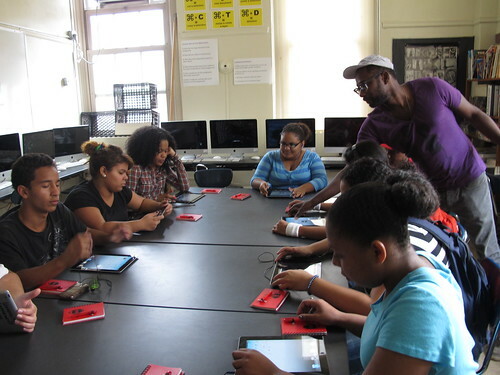 We are fortunate to be working with 20 gifted students at the East Side Community High School in the east village. The class so far has been incredible! The beats these high school students are making have been phenomenal, and Prof Dhundee is able to really draw out their talents while teaching them the fundamentals about musicproduction, hardware, song structure and how to carve out a voice and style with their beats. Stay tuned. And look out Kanye! The new set of producers are already in your rearview! Beat Rockers featured on Huffington Post! 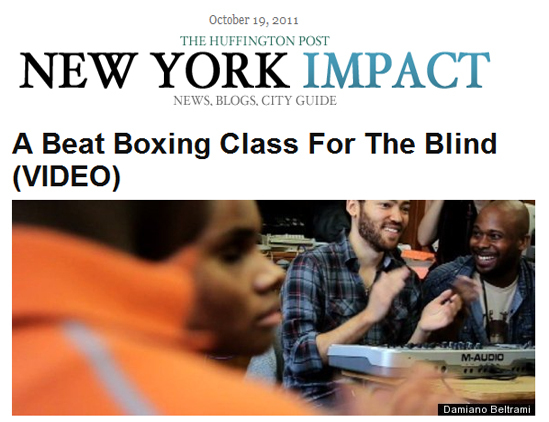 “A Beat Boxing Class for the Blind”, produced by Damiano Beltrami. Great article and video about the kids covered by NY Daily News. Sounds like Scott, the school’s music teacher, has been practicing his kick, hi-hat, and snares…! Article by Daniel Beekman, Video by Rebecca Davis. We’re so proud of these kids. Please help us continue this program! The Lavelle School for the Blind Beat Rockers gave a final performance at school to show off their newly acquired skills in front of all their friends, teachers, and parents. They were accompanied by Beat Rockers instructors Taylor McFerrin, Adam Matta, Chesney Snow, and special guest performers Kenny Muhammad and Masai Electro. The kids blew everyone away with their amazing performance! It was quite obvious to everyone that the they really learned a lot about making music and loved participating in the program. However, we need support to continue providing the program for the kids! We’ve started a Kickstarter campaign to raise funds for the next round of the program, where you can pledge your support and get great items in return, from official BEAT merchandise to rare, collectible autographed items. 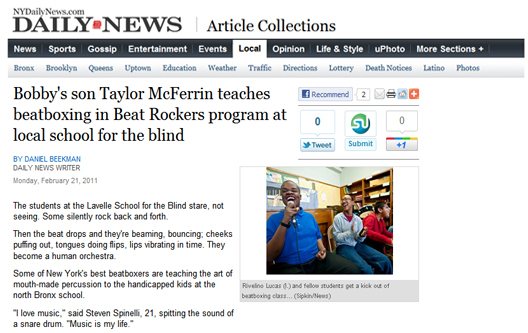 If we raise our goal of $7K, we’ll be able to continue the Beat Rockers program for the kids in the Spring. Anything over our goal goes towards future rounds of this and other BEAT programs. If we miss the mark, however, we don’t get anything. Just check out the video spot we created using clips from classes and the final performance, and if so compelled, please donate and help spread the word! Beat Breakers Director, Ken Swift voted 2nd most iconic dancer of the century! Last month, CNN’s arts and culture program, icon, asked you to vote for your top five iconic dancers of the last century…. Breakdancing pioneer Ken Swift came in second place. Swift is credited with establishing hip hop as a legitimate dance movement and creating many of its classic moves.